Jaculex Review – Boost Your Load? Home » Male Enhancement » Jaculex Review – Boost Your Load? While most male enhancement supplements focus mainly on erection quality and libido, there is another category that often gets overlooked. Their primary focus is increase the volume of your ejaculate. What this does is make your climax that much more pleasurable because the more you ejaculate, the more contractions you have and the more intense they each are. The primary idea is that a healthy prostate means a healthy reproductive system and healthy seminal fluids. You need to take 3 Jaculex pills each day and you can expect to see results in a bout 7 to 10 days. We realize that there’s good and bad in everything, and we like to cover our bases by listing both before we come to a conclusion about a product. There is a 30 day money back guarantee. It’s cheaper than many male enhancement formulas. Jaculex is packed with healthful nutrients. 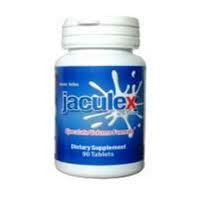 Jaculex does nothing for erection quality of libido. You can purchase Jaculexthrough the official website. A single bottle is a one month supply and costs $39.95. You can also sign up for the autoshipping program where you’ll receive a discount. What’s nice about this is that it is something you have to actively choose to sign up for instead of the way so many others do it by signing you up automatically and often without your knowledge. We’re not sure what Jaculex can do for your ejaculate, and the website doesn’t really explain it either. They talk about how you need a healthy prostate, but don’t demonstrate how taking Jaculex improves that important prostate health. It seems this is more of a multivitamin-type product, but I’d say you can get those for a lot cheaper. Have You Used Jaculex? Leave Your Review Below! Previous Previous post: AntlerX Review – Does It Work? Next Next post: EComplex Review – Is EComplex Discontinued?